Superstition and premonition always lead to fear and worry. Or just the opposite may happen too. These are signs of a weak person, one that is not self-aware. The ones with courage are the ones that know themselves. And if you know yourself, why do you need to lean on a crutch __ a talisman, a fear, a ring or a number? Almost all of us have a good luck charm, a lucky number, and believe in something, often absurd, that we have been conditioned to. Nobody wants to have anything to do with the number 13 for instance. Or we prefer our favorite colors or numbers. There’s a view some people hold that if you bang into a piece of furniture when you are leaving to get something important accomplished, you must treat that as an early warning sign of something terrible that’s on its way. People that champion a scientific temperament will reason against this, intensely. And which is why those who want to believe in superstitions and premonitions will resist the scientific arguments, however reasonable they may be. But here’s a simpler take. If everything is an event in this lifetime, a mere data point, including your birth and your impending death, and since the soul is imperishable, eternal, then what consequence does a furniture that comes in the way or a cat crossing your path or a mere number have? In anyone’s Life, two aspects are absolutely not dispensable: birth and death. Now birth is without choice and death is unavoidable. What else is important when these two dimensions of your Life are inscrutable? The people who champion superstition and acknowledge premonition are those who want to live in fear and misery. And because they feel lonely, they want to drag you with them to provide them company! Try letting go of what clutches you in its stranglehold. Experience freedom from what possesses you. Enjoy being liberated. It’s a beautiful world out there. And a stumble here, a fall there, a number here and a cat there, can make no difference to you, if you choose to feel the air in your lungs and the wind on your face; being present in this, the only certain, happening, available, magnificent, miraculous moment of your Life! Today is Friday the 13th. 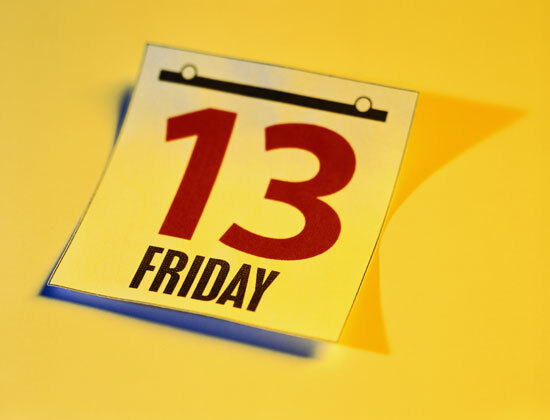 In Western culture, there’s a superstition that Friday the 13th will bring ill luck to people when they attempt anything on this day. Indian culture too has its fair share of superstitions. 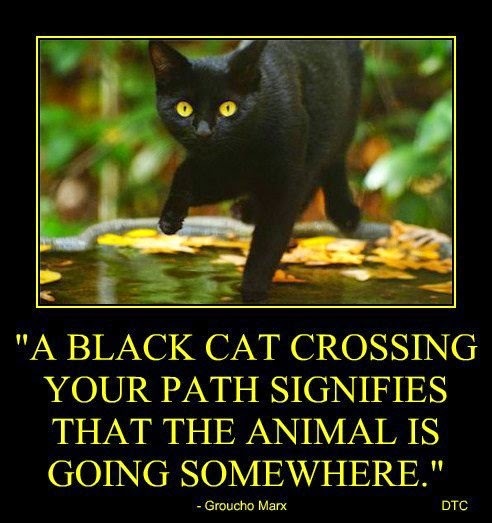 Don’t continue with your journey (or work) if a black cat crosses your path. Or don’t take possession of a new house unless you first boil milk in it. Or respect a weekly timetable of “bad” 90 minute capsules (rahukalam). And many, many more. There are normally two kinds of people. Those who follow superstitions and those who don’t. But there’s also a third category: who don’t know which category of people to follow! They often wonder: Is being superstitious good or bad? Is it foolish to be superstitious? Is being superstitious a sign of being too religious? Let me share my learnings from my experiences of having been superstitious. Firstly, superstition means accepting something __ or even rejecting something __ without having any first-hand knowledge about it or believing (or rejecting) something blindly without verifying. So, in the true sense of the word’s meaning, a believer in God and an atheist, both are superstitious. A believer because, in the normal course, she or he believes so more by following than by seeking (verifying first-hand) and an atheist because, she or he, again rejects blindly without ascertaining if there is a case indeed for no-God! So, theists and atheists, both are capable of being superstitious. Just as scientists are too. Until Liebniz argued that it is possible to have just three digits in the counting system, as opposed to 9, the world of mathematicians was superstitious too. They accepted a 1 ~ 9 count, just as we have all done, without pausing to verify, question, argue or debate. So, the point being made here is that there is nothing wrong in being superstitious if you are comfortable in following something__anything for that matter__without questioning, without verifying. To me superstitions are an integral part of growing up – of evolving. I once was sitting in front of a very learned astrologer, who, seeing the rings on my fingers, asked me why I was wearing them. I replied saying that a well-known gemologist had recommended that I wear them to “ward off the bad times” that I was faced with. He laughed and asked in Tamil: “Kallaala Vidhiya Matramudiyuma Sir?” (Can stones change destiny?). He then went on to explain: “Sir, don’t accept anything just because you find it comfortable to believe it or to follow it. Not even what I am telling you. Challenge every assumption, ask, seek…and from the answers you get, pick the one which you feel you can relate to the most. Choose that which you feel is the most common-sensical. In doing that you will always be at peace.” I have followed his sagely advise to this day. So, the question here is not whether a superstition works or not. Or whether it is right or wrong. The question here is have you verified what you are following? Are you convinced of your line of thought and action? If you have done this check, then what you follow is no longer a superstition, it is a belief. And, importantly, if you have chosen to not believe something, it does not mean that someone else believing in it is wrong. Respect that the person may have as much strong evidence to support her or his belief as you have against it. Bottom-line: any day, any time is good, but no day, no time is better than today, the NOW, to live and to celebrate Life! So, please don’t let anything – not even your beliefs – ruin this non-stop party called Life for you!